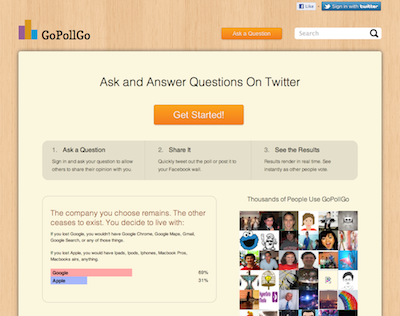 GoPollGo is a free, quick and easy Q&A polling site built on top of Twitter. The votes are shown in real time on a color coded map of the United States with the ability to click on each state to further see the breakdown of votes. Users can easily post their poll to Twitter, allowing their followers to vote, while gaining instant feedback on their question. GoPollGo makes it easy for you to see what people are thinking.